The giveaway is now over and any comments left after 7PM on March 7, 2010 as recorded on the comment will not be counted. The winner will be chosen tomorrow so check back then to see if you have won! The Sweetest Kitchen hasn’t always been The Sweetest Kitchen. I started out blogging about cupcakes in late May of 2008 at Blogspot; my blog was then called The Cupcake Review. As I started to expand and blog about more than cupcakes I knew that I needed to switch to my own domain. After much thought, I finally decided on the name The Sweetest Kitchen in late February of 2009, and launched the new domain on March 3. It’s now been one year and my blogging experience has been such fun. The Sweetest Kitchen has became more popular than I ever expected it to – I’ve almost reached 500,000 page views! My most famous post, with at least 30,000 page views so far, was the zombie Halloween cupcake I made for Iron Cupcake: Earth and Cupcake Hero in October 2009. However, my personal favorite of anything I have ever baked since beginning this blog is the pumpkin dulce de leche cupcake. Everyone who has made these has raved about them, and I’m so happy about that! Today I’ve made some cupcakes in celebration of The Sweetest Kitchen’s 1-year anniversary. They are actually very similar to the pumpkin dulce de leche cupcakes, but instead of the pumpkin cake, I used a chocolate cake and sprinkled the frosting with sea salt. The great thing about this dulce de leche is that I didn’t have to make it myself. I bought it at the store, where it was casually sitting next to cans of plain sweetened condensed milk and selling itself under the pseudonym of “Top ‘n’ Fill Caramel” from Nestle. I found this at Coles but not Woolworth’s (in Australia), for anyone wanting specific details. And I recommend giving the caramel a good stir with a wire whisk before using to smooth out the lumps. 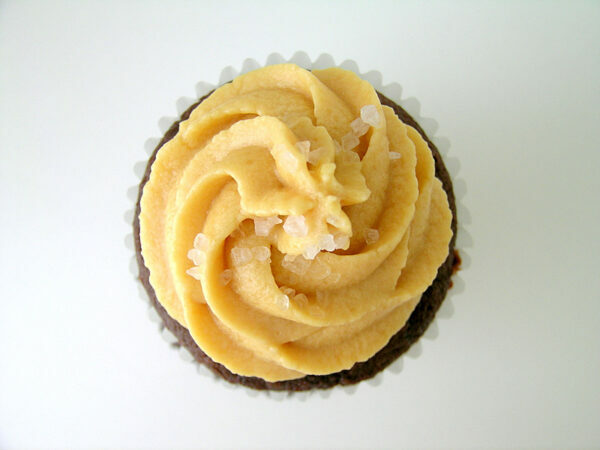 If you can’t find dulce de leche, find directions for preparing it yourself in my pumpkin dulce de leche cupcake post. Okay, now I’ve given you some cupcakes for my anniversary party, now what about that giveaway, you say? Right, let’s get to it. Bake It Pretty is one of, if not the, best places to buy your baking supplies from online. I have made my share of purchases from this lovely store, and Amanda, the owner, is so sweet. In fact, Bake It Pretty is where I got those zombie hands and spider toppers that made those particular cupcakes of mine so famous! I knew I wanted to do a Bake It Pretty giveaway for my blog’s anniversary, so here it is – leave a comment on this post to receive a $50 gift certificate for Bake It Pretty! Earn an extra entry by mentioning this giveaway and a link to this post on Twitter! Leave a comment on this post with the link to your Twitter status that mentions this giveaway. Earn another extra entry by mentioning this giveaway and a link to this post on your blog! Leave a comment on this post with the link to your blog post that mentions this giveaway. You have until Sunday, March 7 at 6:59PM to enter. In the meantime, click on over to Bake It Pretty to create your wishlist! Note, the deadline is Sydney, Australia time, or Pacific Standard Time in the US on March 6, 11:59PM. Omg, I’d love to win a gift certificate from them. Went to their site & blog & they have a lot of cute things. Count me in for the contest. Hey JamieAnne – happy blogaverissary to you! Glad that you have found your niche with this blog and what a great giveaway! The Top and Fills can be found in Woolies as well – some stocks stock them others don’t. Just depends on location. I know from my experience you can get certain products from one store but not the other – you have to wonder why that is! Oh what a lovely giveaway, I would la la LOVE to win! Those cupcakes look amazing! Happy anniversary! happy blog anniversary! those cupcakes look delicious! I am totally loving the giveaway! HAPPY BLOGIVERSARY! I have truly enjoyed your Cupcake Hero participation and December hosting. Here’s to many more blogging years! PS- I heart Bake It Pretty! I’ve never gotten anything from there, but have wanted to for a while!! Would love to have the gift certificate to spend…. yum!!!!!! the cupcakes look awesome!!! delicious! happy anniversary! I love dulce de leche! Omg! $50.00!!! Thats crazy! Well I will definitley be entering in on this one 🙂 Congrats on the anniversary! I’ve been dying to make the dulce de leche cupcakes since you’ve posted them but they’ve always been in the back of my mind and I haven’t had the confidence to make dulce de leche! How exciting to see how much your blog has grown. Bake it pretty is such a cool site! Oh my.. that looks amazing. Happy one-year anniversary!! Mine is coming up this month, too!! Congrats! Hi, Jamieanne. I enjoyed reading your anniversary post on an enticing cupcake combo – I’m always looking for unusual variations. Dulce de leche and salt are great together. In fact, I’d just done a cayenne-cocoa cupcake with lime cream cheese frosting, which I recently posted: http://islandeat.wordpress.com/2010/02/26/a-sweet-sassy-finish-to-the-2010-olympics-cayenne-cocoa-cupcakes-with-citrus-cream-cheese-icing/ if you’re interested…. Please enter me in the great contest. It looks like a great resource for packaging up baked treats for friends. I just saw those cupcakes yesterday on flickr. Great job! Thanks for telling us about bake it pretty what fun! Hi Jamie. Your website’s responsible for getting me baking again. I love the pumpkin bread & am working my way through the cupcakes. I can’t wait to make velvet cake for Jas’ birthday (he goes for Liverpool FC so will love the red & white). Happy Birthday! Those cupcakes look delicious. I’ve never made anything using Dulce De Leche but I think I soon shall… Keep up the extremely tasty work with this blog! Happy Birthday! Isn’t the appropriate first-birthday behaviour to smear that delicious cupcake all over your face? I love that canned Dulce de Leche, which I find here in the US in the International food section of the market. Such a time saver! And Bake it Pretty is one of my favorite imaginary web shopping destinations! I’d love to win! Congrats on blog birthday. It has some great cuppys. Pick me please! CUPCAKES. Cupcakes are excellent. Can I just say that anything with caramel usually stops me right in my tracks. Love caramel. Good cupcukes. mmm…..Thanks for the giveaway. I love Bake it Pretty! Please enter me. Happy blogiversary! I gave you a shout out on twitter (http://twitter.com/anxiousdog/status/9926374967) and also on Facebook just for good measure. Can’t wait to see how well your contest goes! Keep up the good work! Since my hubby is Latino, I love anything Dulce de Leche, but have never seen cupcakes made from it, so this is definitely something to try out! Congrats on a year of blogging, and wishing you many more years ahead. I can think of so many cute things to bake with goodies from Bake It Pretty! I’d never seen their shop before, but I’ve definitely got it bookmarked now! how decadent! a perfect birthday cupcake. Great giveaway! I’ve had a Bake It Pretty wishlist for so long. Happy Anniversary to The Sweetest Kitchen and congrats on a year of success. Those Pumpkin Dulce de Leche cupcakes were amazing, probably the best I’ve baked! 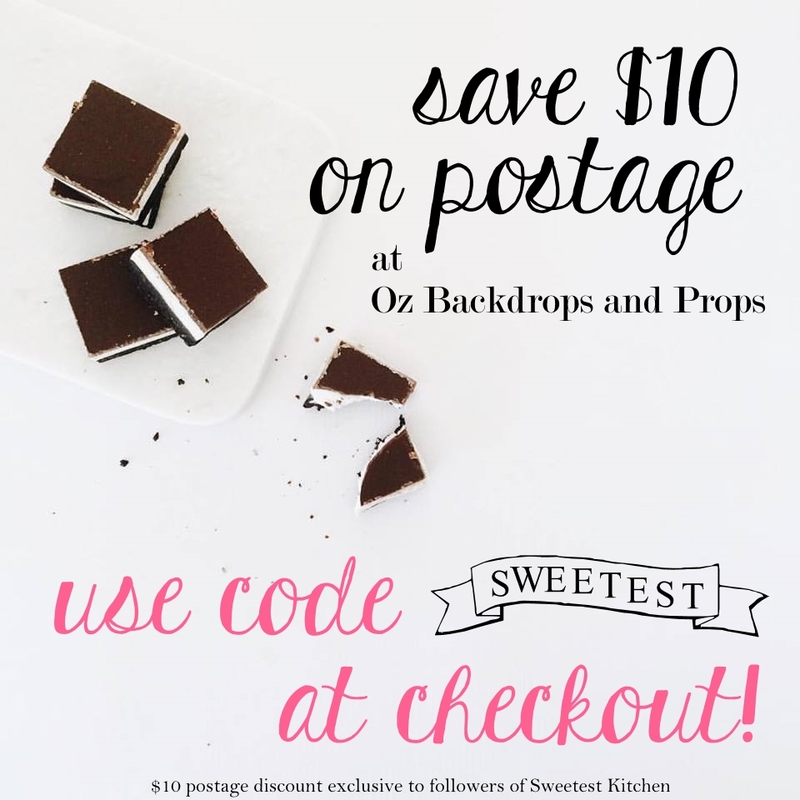 I’d love some new swag from Bake it Pretty! What a great giveaway! These look absolutely great. Love the photo of the inside. Happy Anniversary! Those cupcakes look absolutely A.MAZ.ING. Wow! Your website is so fun!!! Those cupcakes loook sooo scrumptious! I’m thinking about making my husband the nutella/coffee frosting on a chocolate cake for his birthday. I love baking and cupcakes sooooo much, and adore this giveaway! Congrats on a year, and oh the fun I could have with a gift certificate. Happy One Year!! Is this open to all? I’m in the U.S…but if I can, count me in. Looks like a great site! Yes, it’s definitely open to all! And I love Bake it Pretty. I’ve never ordered from there because I’m afraid I just won’t stop. But I love to browse. Happy One Year!! Congrats. I love cupcakes and had no idea this store existed so thanks for sharing. I’d love to win too! OMG those look so yummy. I’m drooling so much I am afraid I might short out my keyboard. I’ve been following you for ALMOST a year. Happy anniversary. Your blog is a great collection of talent and creativity! Happy anniversary. Nice give away. Your cupcakes look yummy! I think I’ll try them out on the family this weekend. I live in Australia, and have been admiring Bake it Pretty for eternity!!! I have been dying to order some (if not all – lol) of their products, but have not, due to the shipping bill (yikes!) It would be A-MAZING to win this!!! Happy Anniversary!!! How exciting! 🙂 Please count me in for the giveaway! I have to make a big meal for some youth next week, and I think some cupcakes will definitely be in order for the dessert! Thanks for the inspiration! Funny…I made chocolate cupcakes with Dulce de Leche filling 2 weeks ago! My husband LOVED the pumpkin ccs w/ddl (I did too!!!) and had been requesting them. But I have a “thing” that baking with pumpkin is for fall (even though my cabinet is stocked year-round!) so I refused. After all, good things come to those who wait, right? I would love to give them a try. thanks for the giveaway! Happy Anniversary! I love your blog. Your cupcakes are some of my favorites, especially the brown sugar ones. ohh the pumpkin one looks great, and happy 1st anniversary! What a nice giveaway! We made lemon cupcakes with purple powdered sugar the other day…tasty! Yum! I love this idea of a dulce de leche filling. I love Bake it Pretty! and I seriously love that cupcake! Happy Anniversary!! Your cupcake looks delish! Congrats on a year! That’s terrific. Happy anniversary! The filling on these cupcakes looks so delicious! I LOVE cupcakes! I have a date with friends every thursday to try new cupcakes around the city and im an avid baker. Yours look scrumptious! I’m trying out these beautiful cupcakes this weekend. Never thought of using sea salt, (even though I JUST had sea salt/rosemary bread the other day) — what a good idea! hmm in my mouth please! right now!!!!!!! Happy Anniversary! Yay! I am blown away, 50,000 views, if only I could get there! I can’t seem to get any more views than my friends and fam! Well I would love to win the bake it pretty certif, I love their stuff! 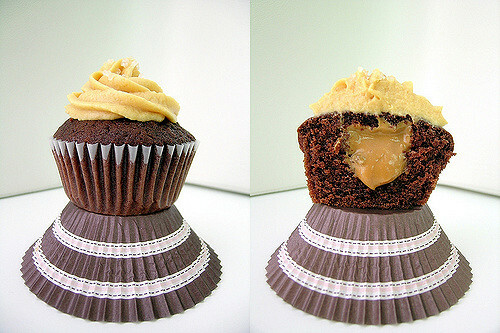 These Cupcakes look awesome and with homemade dulce de leche they must be the best! Thanks for your wonderful ideas which fulfill my morning! I love Bake it Pretty – and your blog! Second entry – at my blog! I would love diving into one or two of these delicious cupcakes after I get home form a long day of teaching my wild fourth graders! Thank you for doing this giveaway. These look very delicious! I would love to win to try them out. Mmmmm…those look gooey and delicious! I would love love love a giftcard for BakeItPretty! I also love that website, especially the flavor oils. You are such an inspiration! I am new to the food blogging world, and I can’t get enough of your website. I love it! i loooooove dulce de leche! they look delish! Your pumpkin dulce de leche cupcake looks amazing! I would love to try it:) Thank you! Your website is really fun to read. Scrumptious! Bake It Pretty has fabulous stuff! I can always use more baking supplies! Happy 1 year! totally in love with cupcakes! Happy 1st Anniversary!!! I love Bake It Pretty and would love to win the Gift Certificate!!! I love your website. Happy Anniversary! I love abking especially cupcakes. it would be great to receive this gift cert. to buy more baking supplies. Friends and family would be happy too. Will rush right over to check out Bake It Pretty since I’m planning a baby shower soon and am always up for cute new supplies. I love individually frosted cakes! When I make cupcakes, that’s what my son says. Makes me laugh every time. I would love to win this. Oh, I have to try these cupcakes! They look really good. And I love Bake It Pretty! Pick me! i love bake it pretty!! I am a HUGE fan of Bake It Pretty, in fact, I included an image from that site on my blog post today! =) I am glad I found your blog so I can live vicariously through yours sweets! Thanks for a chance at this giveaway! those cupcakes look devine! i am a huge fan of bake it pretty – don’t know what I would buy first. I just found your site via Bake It Pretty’s blog, and I’m glad I did. Those cupcakes look yummy! And I would LOVE a gift certificate for Bake It Pretty! I already have my wish list ready! As an Australian who moved to the USA last year (for an American bloke), I have been loving the gorgeous baking supplies and websites here, and Bake It Pretty is at the top of course! A gift certificate would be absolutely fabulous so I can buy pretty supplies for the cupcakes I bake here that apparently ‘rock peoples’ socks off’ and have one of the best icings that people have tasted (Australian recipe). I know, the US has so much more awesome stuff for baking, that’s almost the main reason I’m going to miss it! Looks delicious. I love anything pumpkin. Happy 1 year anniversary! Just found this site…I am new to the cupcake world, but I am becoming obsessed! I love new ideas! I would looove a gift card. My boyfriend and I are getting a house (just put in an offer yesterday! Crossing fingers!) and we will FINALLY have more than two feet of counter space to work with, so I anticipate even more baking in my future. Congratulations! I’ve also tweeted (@susanhopr, but my feed is private). I’ll never lose any weight if I keep checking out this site!!! Happy 1 year anniversary! I Love cupcakes. Thanks for the great giveaway! Those cupcakes look delicious! Thanks also for all of the hard work that goes into your lovely blog! i love sweetest kitchen and bake it pretty. i am sooo excited that you guys have joined forces to spread the word on tasty treats!! cheers!! I wish I were eating that cupcake Right now! Thanks for doing this great giveaway. Your cupcakes look amazing. I’m just getting started in the cupcake world, but I’m already obsessed!!! I love your blog & I love Bake It Pretty! And I hope you have a very happy birthday! I’m glad I found this blog! can’t wait to read through it all! Look at all those spices! And I LOVE the Heart Egg and Pancake Shaper! Ooooh. Love the sprinkling of salt on top! I’m hooked on salted desserts and this one looks divine. I LOVE Bake it Pretty…I am new to your blog…I am hooked! Thanks for a wonderful giveaway…and Happy Birthday!!!!! I have an auction fundraiser for my daughter’s school and I think this is the perfect cupcake to make.. Thank you so much for the recipe. The parents won’t be able to resist buying them! Thank you for sharing Bake it Pretty too! Great, if you decide to make these cupcakes for the fundraiser, let me know how it went! I love Bake it Pretty’s stuff! And those cupcakes look sooo good. Oh! Me too, me too! I want to enter! I’m due in a few weeks and would LOVE to do some more baking (need to stock up!) before the baby gets here. New toys would be amazing!! I love Bake it pretty! It would be so great to have a gift certificate there! Love your blog. I found my way here from Bake It Pretty. I plan on visiting again. I would love to shop at Bake It Pretty! What a lovely blog and a generous giveaway! Can’t wait to try chocolate-caramel-salt cupcakes! I love that Top n Fill is readily available in Australia…..so much easier than boiling the tins of condensed milk!! I know! Now that I know where to get it pre-made I won’t ever be making it myself again, takes too long and some methods are just too risky! Bake it Pretty is a new favorite of mine!! Great idea for your blogiversary. How fun to talk about cupcakes and baking everyday. That is the “sweet” life. Congrats! What a great way to celebrate a great milestone! There are so many cute things at Bake it Pretty, thanks for the chance! Happy Blogoversary! Such a fab giveaway, I heart Bake It Pretty! LOVE this site. Happy Bloggiversary!! This is my first visit. Can’t wait to visit again. I love your blog! This giveaway is amazing and generous! I have always wanted to get something from Bake It Pretty! Oh, please pick me! I love your blog – not to mention Bake it Pretty! Wow – I have no idea how to link to a twitter post. . . I thought I was so with it. Thanks for the fun blog! http://twitter.com/jodiodeeo – does this work??? I love the Pumpking Dulce De Leche, and you introduced me to Bake It Pretty. Love your blog. Happy annivesary!!! 🙂 hope I win 🙂 and I will def. Be mentioning this on twitter! OMG I forgot to mention. HAPPY BLOG BIRTHDAY! When I used to host my personal blog it was amazing how much it had grown & how time passed by. May you have many many more successful years! Wow! Those cupcakes look so yummy!!!!! Thanks for the chance to win something yummy!!!! Fabulous post. I’ve GOT to try these. Chocolate AND dulce de leche. Oh my…help me please…this looks so delish! I love this. Can’t imagine a better combination. This cupcake looks amazing! I love that dulce de leche frosting!